Slice the potatoes thinly length ways and also cut into 3 inch circles. Place into a taco stand and cook at 300 degrees in clean oil for 2 minutes. Then remove and turn up the oil to 375 degrees and then re-fry the potato tacos until crisp. Place on paper towel to drain any excess oil. Place the onions in ice cold water for 20 minutes to remove the strong onion taste. After 20 minutes squeeze the onions dry in a towel and set aside. Place the crème fraiche in a bowl and whisk until it doubles in volume and becomes stiff. Fold in the onions, hard boiled sieved egg and the horseradish and correct the seasoning with salt and pepper. Place the crème fraiche mix in to a piping bag and refrigerate. Place the taco shells on a plate (5 per order) and pipe in the cream mixture. 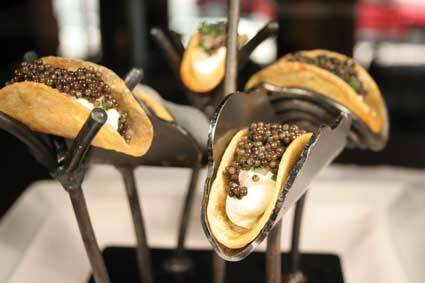 Place a small amount of onions on top then the chopped parsley and finish by adding caviar atop each taco. Serve immediately.